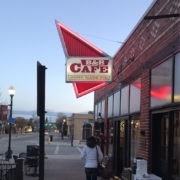 As a Sci-Fi writer, I’ve lately found it uniquely satisfying to write about my present hometown—Castle Rock, Colorado. When I first contemplated on penning a story that would take place in this small rural town where I live, my main motivation was the time and energy it would save me from having to research out some other more distant location. For instance, my supernatural spy novel, Mad Powers, primarily took place in Washington, DC. I’d spent a week there, along with my wife, scouting out the not so typical historical locations that could be used within the story. It was fun, but also very time-consuming. And added research that accompanied the trip continued on for weeks after. Anyway, back to my latest novel, “The Hidden Ship.” The idea for the story, which is your basic invasion from interstellar aliens, with malintent purpose—a planetary takeover viewed from a small-town perspective—actually came to me while having breakfast at a small greasy spoon right here in town. 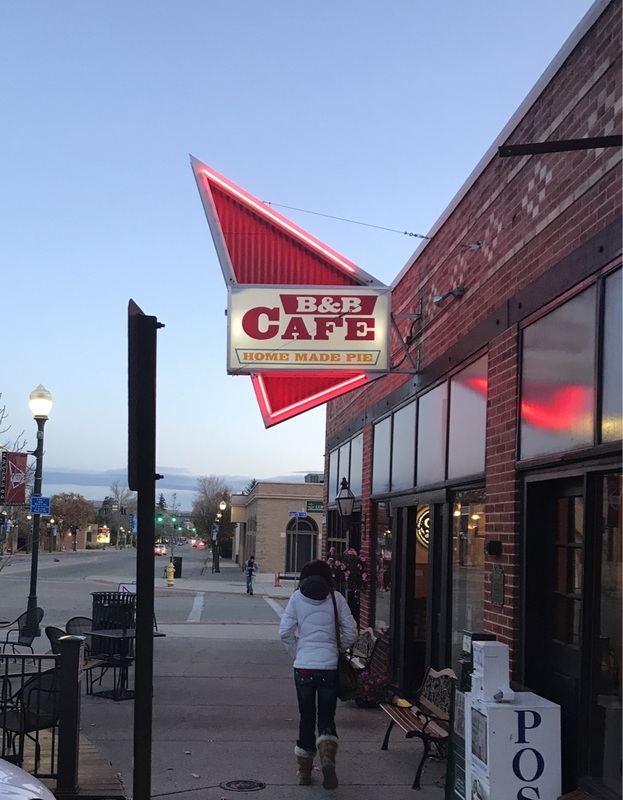 The B and B restaurant, a building well over one hundred years old, has a colorful history all its own. At one time the town jail was located across the street and prisoners were regularly shuffled over for meals. In an unrelated incident, a local lawman discharged his sidearm in the course of his duties. The bullet hole in the ceiling still remains unpatched. As I took in the creaky oak flooring, the cracked marble countertop, and the tinny bell that sounded every time a new patron entered, I contemplated on how a scene in my next book could play out: How normal everything would appear on the face of things. Platefuls of huevos rancheros, or oversized stacks of buttermilk pancakes, would be served onto scuffed and marred tabletops. How seated locals would welcome the arrival of friends and neighbors, now sitting at nearby tables, until three of ‘them’ arrived. The tinkling little bell over the door pulled everyone’s attention toward the trio of Earupitan marshals now entering. Seven-foot tall, each wore cowboy garb more appropriately seen on the set of an early 1960’s TV western—perhaps like the Lone Ranger, or Roy Rogers. Three aliens that tried way too hard, attempting to assimilate into this small, mostly rancher, community. And that was it. I was off and running. In my imagination, I started to play the ‘what if’ game. What if a local rebellion group was seated at a table when the three alien marshals arrived? Taking the storyline a step further, what if there were also human conspirators—modern-day Benedict Arnolds—in town as well? And then the thought came to me, what if my story’s chief protagonist had a secret? Something dangerous in his possession that no one else had—a small spacecraft hidden in his barn. The best stories, at least for me, start out as rough concepts. Then I let them visually play out in my mind. I actually see the scene—like frames of a film streaming forth in my imagination. But it doesn’t stop there. I stay conscious of my own reaction to what I am seeing as if I were seated in a theater watching the movie unfold. And I take note too of the reactions of those seated around me. They are my readers—the ones that count most. The folks that will buy my book and, hopefully, enjoy the words I scribe, which eventually end up printed in paperback, e-reader, or audiobook. I always watch for one of your books on Amazon.. and I THINK I’ve read ’em all (I think…), and Hidden Ship was just as good as I’d hoped. Initially, before I read it, simply from the title I almost thought it was a ‘take’ of “Junkyard Ship”, which was possibly the very first of your books I downloaded from Amazon Prime to my tablet (my “preferred” reading medum), and enjoyed it enough to eventually “grab ’em all” over time. I’ve read so much ScFi over my life, that too many of them all seem to “run together”, but in your works, I truly enjoy what I see as the main thing I really enjoy; simple “basic science fiction” that doesn’t make me “roll my eyes” when a writer assumes I’ll suspend all belief in reality or the realm of believability… And I thank you for that. Plus, it doesn’t hurt that I can identify with your “locales” since I live in what USED to be unincorporated Arapahoe County, and is now “the thriving community of Centennial” (pun intended), so there’s bit of “identifying” with the storylines as well. “Once upon a time”, I imagined myself as a “SciFi writer” but being a “Workaday Willie”, there was never time.. nor (I suppose) sufficient ‘drive’ in my imagination to actually DO anything about it. I.T. can affect one like that.. Too mentally exhausted and ‘frustrated’ at the end of too many days, y’know? I started writing at 55. You’re never too old – go for it!! I am an aspiring writer and have started to write my very first book. I came across one of your posts on a website about how a unique vocabulary can really broaden a story. I was hoping I could ask you a few brief questions about that. I enjoyed reading about familiar place names in Scrapyard Ship. When I started reading The Hidden Ship, I noted the detail about Castle Rock: B&B, auto registration across the street, Elizabeth to the east. Of course, there was a little variation in some names… Wilcox Ave. vs. St., “City of Castle Rock Fairgrounds” vs. Douglas County, “City” of CR vs. “Town”. Curious, I looked at the “About” page on this site and discovered that you and I have been “neighbors” over the years. I grew up in Newbury Park and currently live in Franktown – on his trip to Randy’s [mom’s] place, Brian would have passed within 1/4 mile of my house. Hey Don – yeah, I guess we’re neighbors! Seen any HovT crafts in your area?